On the anniversary of the bombing of the Boston Marathon, my thoughts are with all those affected. I’m looking forward to seeing the race come back better than ever next Monday. In our family, we’ve got birthdays in January, April, July, August and December, which means I’ve had many opportunities to experiment with various recipes to come up with the perfect chocolate cake and frosting recipes. The ones I’ve tried in the past were either too dry or too brownie-like (don’t get me wrong, I love a good brownie, but not when it’s supposed to be cake)! Finally, I’ve found the best chocolate cake ever. 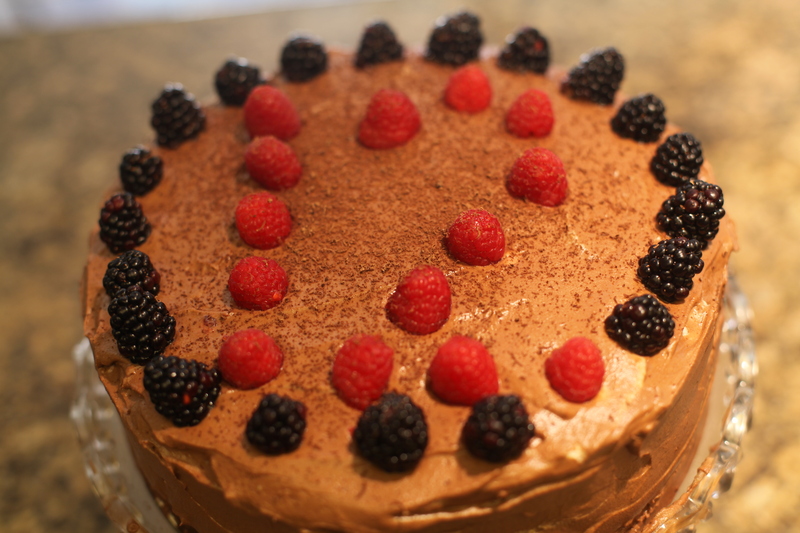 The following recipes make a two-layer chocolate cake with chocolate mousse frosting and a chocolate/raspberry/blackberry filling. For the cake, use organic sugar (regular sugar is too bitter) and high quality cocoa powder (not hot chocolate cocoa powder) — e.g. Ghirardelli or the raw cacao sold at Sprouts. For the vegetable oil, we used safflower oil. For the mousse, the ingredients list is at the end of the video above. Double the mousse recipe to frost a two-layer cake. Use a high quality brick of baking dark chocolate like Valrhona. Put the metal mixing bowl in the freezer before you whip the cream and make sure the cream is chilled beforehand as well. Again use organic sugar. For the filling between the two layers of cake, mix 1/3 of the chocolate mousse with a small pack of blackberries and a small pack of raspberries. Frost the cake with the remaining chocolate mousse and garnish with the remaining berries. You can shave some extra chocolate on the top with a cheese grater if desired. To keep the frosting from melting, put the frosted cake in the refrigerator until you’re ready to serve it. Enjoy!